Another failed attempt to get a photo of the Swedish Snowflake as Blogger insists on washing out the red. Nothing like technology to keep one humble? While I more truly consider the solstice to be the end/beginning of the year, I haven't much liked the way the 'new' year has started so I'm going to go ahead and join with the rest of society and proclaim that midnight tonight is the end of the year and the beginning of a brand new one. Beginnings are always so...optimistic. Nothing has gone wrong - yet. Everything is shiny with promise. We get a chance to try again and this time, maybe, things will go 'right' instead of 'wrong'. The great cycle of life has turned one full rotation and we are ready for the sun to return, for life to spring anew. This is a time for hope and optimism. From our house to yours - may you have everything you need, looms and wheels etc. that behave, yarn that inspires, creative ideas that keep you excited about each and every day. May we all have a very happy new year. Hmm - Blogger doesn't seem to 'get' red. While this wasn't a great photo to begin with, it wasn't washed out until I uploaded it to here. At any rate. 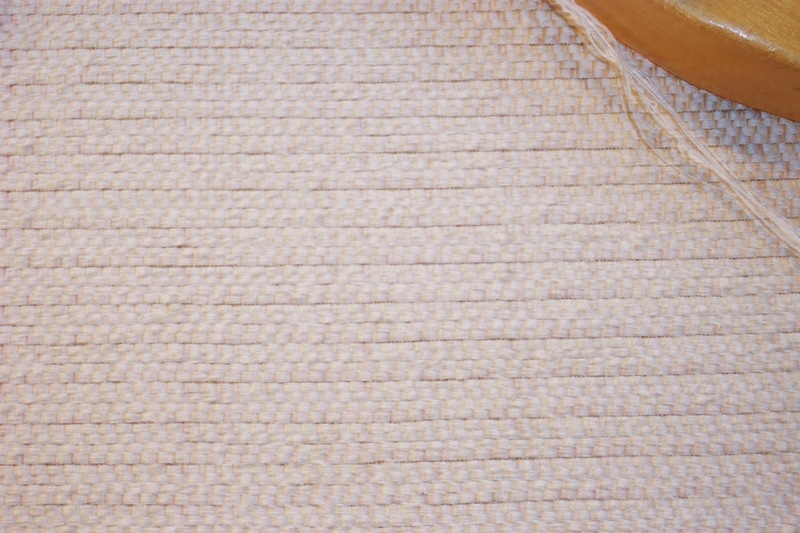 This is what 27 yards, more or less, of 2/16 cotton warp with 20/2 cotton weft at 32 epi/ppi looks like. The 20/2 is is most likely open end spun. It's much weaker than my 2/20 mercerized cotton and much fluffier. In fact it's comparable in terms of grist (or thickness) to the 2/16 which is ring spun. So I didn't adjust the density when I switched to the 20/2 cotton but treated it as though it were the same grist as the 2/16. And it seems to be quite happy. 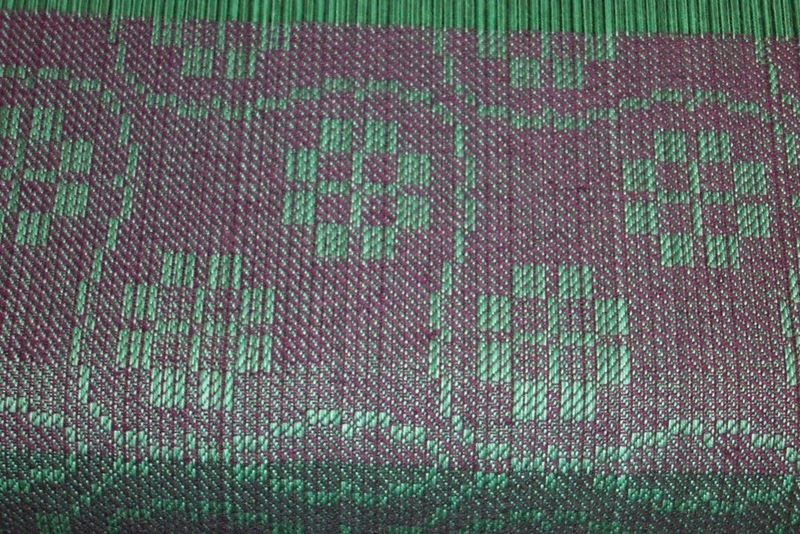 Although the weaving is done, the cloth is far from done, done. Next step - inspect and repair, then measure, cut and serge, then wet finish, then hem, then final 'finishing' press. 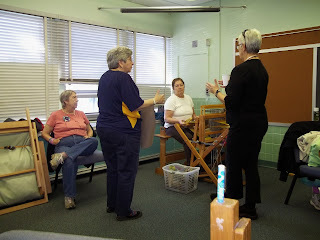 In the olden days professional weavers just wove. 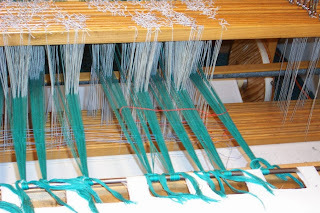 All the rest of the things that go into making a web into real cloth was done by other professionals. We don't have that system in the 21st century. Sometimes I really wish we did! 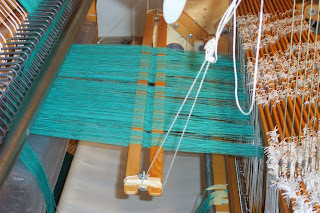 Not entirely sure what will go onto the AVL next so I may just weave on the small loom for a while. It's all weaving, after all. There is a red warp ready to go with another in the wings waiting for weft to arrive. So if I finish the red one - which I ought to do - I will likely put the blue one on the loom. There are still 8 scarf warps to be wound and shipped to the dyer before I leave, too. But one by one I am crossing things off my list. And that's a very good feeling, yes, indeed. Even if it means I have had to shuffle the order somewhat. 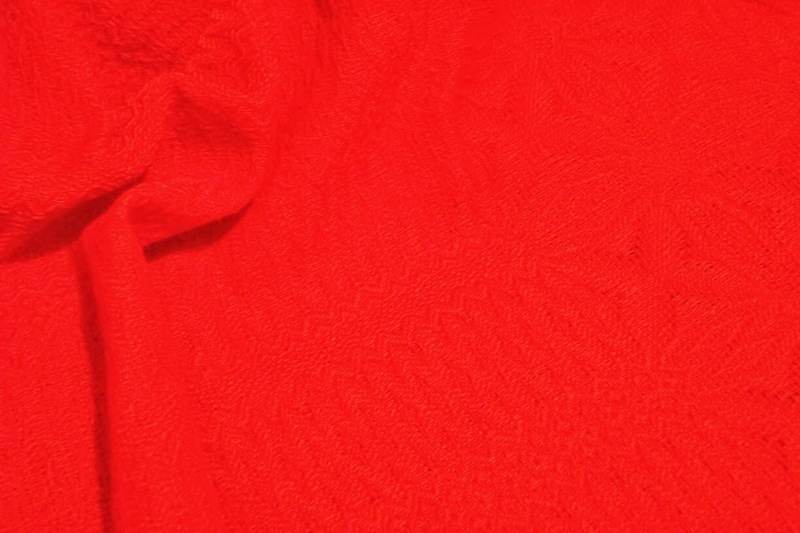 The only problem is that I'm running low on red to go with the cones of cotton flake from Lynn's stash. 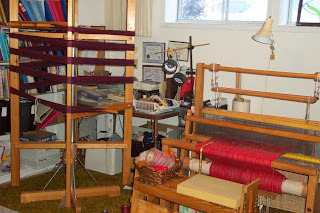 While I might be able to wind warps, there won't be enough for weft. And so another yarn order has been sent in. It won't get here before I leave, but it will be by the time I get home. And then it will be full steam ahead? 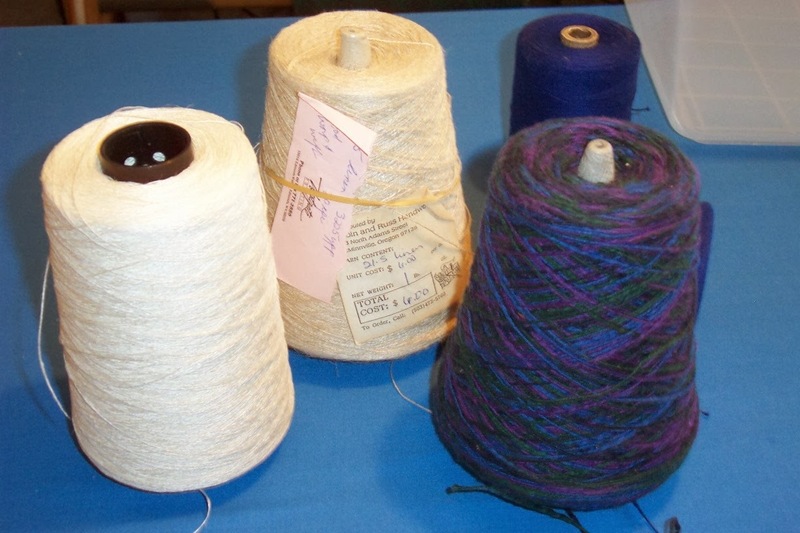 In the meantime I found some medium value blue which will be 'ok' with the cone of blue/purple/green cotton flake and started winding that. The red warp on the AVL is almost finished - the plan is to get that off the loom tomorrow and then concentrate on the towel warps on the Fanny. The suitcases are out, ready to be filled. My ledger is almost ready to take to the accountant. Just waiting to see if there are any more bills that need to be paid before the end of the month. And if you haven't already participated in the poll, I am looking for feedback on what my 'next' Big Project ought to be. I must be mad thinking about doing another book, but this time it will be digital (if I do it at all) given how much postage rates have risen and are threatening to go ever upwards. I fear Canada Post may become as extinct as the do-do bird in a few short years. By which time I really hope 'they' have a matter transmitter - that actually works. Who would have imagined that when I chose weaving as a career it would span 40 years - and hopefully longer? I'm not quite sure what I envisioned when I made that fateful decision around March of 1975 to become a professional/production weaver. But in a little over a year, it will be the 40th anniversary of that decision. Don't ask me why I'm thinking about this now with so many other critical deadlines on my plate, but other people, other businesses, do something to mark a significant anniversary. So I'm thinking I ought to do something, too? If I can figure out how to load a poll onto the blog, I will ask you, dear readers, for feedback on what that something special might be. Nothing like having Another Big Project in the works for when the next one is done come May? I love maps. I like to pore over them, putting myself in context with where I am, and where I want to go. I use things like lists and outlines to help define my goals and what I want to accomplish. Most time I don't have actual written down lists, just mental ones. But at times a project becomes so big I can't quite capture it all in my imagination and then I need to use real written down lists. Being self-employed most of my deadlines are self-imposed. It took years for me to realize that if I missed one of those it was not a big deal. I just tore up my out dated list and made a new one, or revised my deadline to reflect Life Happening. So while I didn't get the experiment for Handwoven done when I wanted to, I'm still well ahead of their deadline. It's all but ready to package up and mail (samples, cd with file, etc.). Just waiting to hear back about a couple of questions I would like answered before I send. There is a yarn order on my desk, which I intend to send tonight, a conference proposal I'm not sure I'm going to apply to teach at, and then...then it is the turn of the formal outline for the Project That Cannot (Yet) Be Named. The magnitude of this project is such that I have to work with a team and, since they can't read my mind or tap into my imagination, the only thing to be done is to draw up a real written outline - a blueprint we can all follow. Then once we are all on track I can proceed with my end. 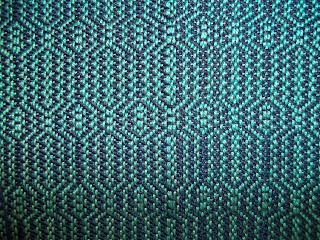 But time has gotten very tight given all my other committments and I am going to have to stop working on generic stash reduction and start on the woven samples for The Project. Once I have my 'map' I know what road to take, so to speak. After all, if you don't know where you're going, any road will do. 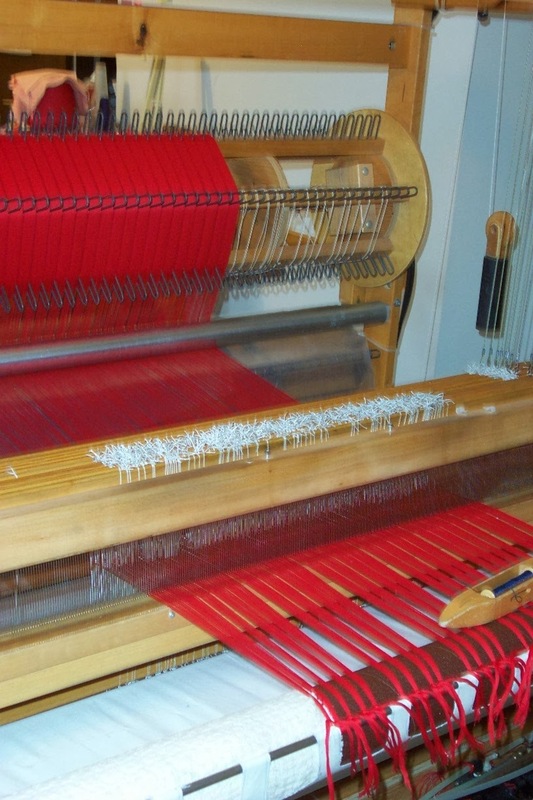 Beginning of the red warp showing the header where I checked for threading/sleying errors, decided on a treadling and just generally made sure the loom was behaving. 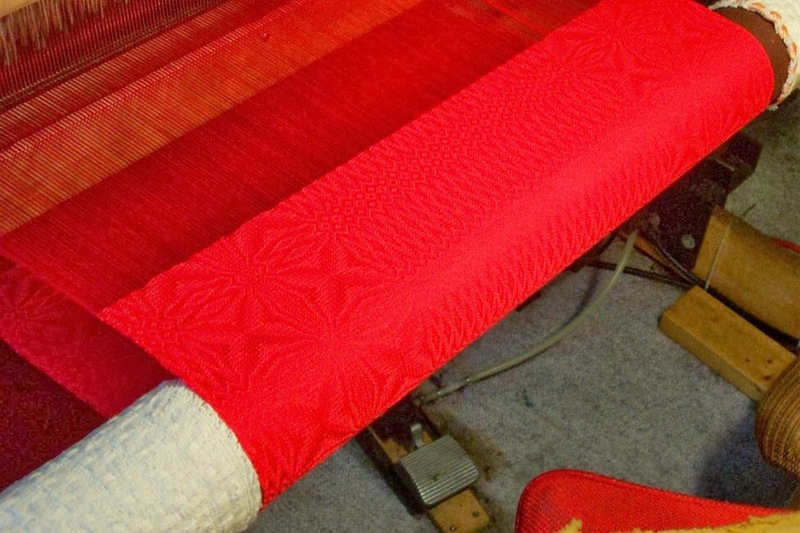 Red on Red Swedish Snowflake motif used as a border on each side of the warp. 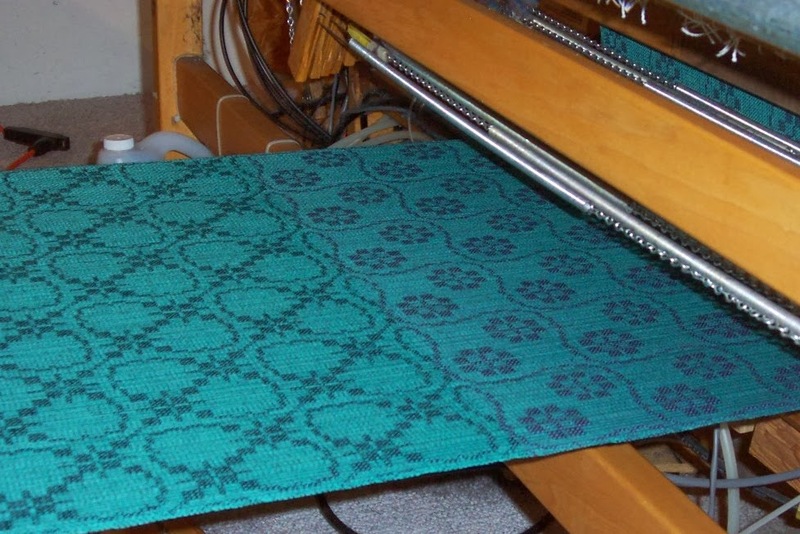 I fiddled around with the motif and centre field to make it fit the number of ends in the warp (24" x 32 epi) and wound up with a few extra ends which are hanging off the back of the loom. These threads will not be wasted but given to a friend who doesn't mind taking some time to sort them out for her own use. 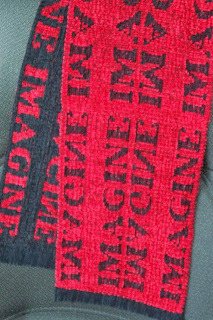 I'm not entirely sure I'm happy with the white weft on the red - the contrast in value is a little 'extreme' for my tastes. But as towels? I'm sure someone, somewhere will be happy to have them. They just wouldn't look great in my kitchen. Since I rarely weave for my own use, though, I'm happy enough with them and they will go into inventory. Plus that cone of half-bleached singles linen is now officially used up. I love fine yarns, but they do go on for a very long time. You certainly get your play value out of a cone of fine yarn! The 20/2 red I'm using for weft has a bazillion yards per pound (20 x 840 = 16,800 divided by 2 = 8400) I should have weighed the cone before I started winding bobbins, but I expect it is around 2 pounds. 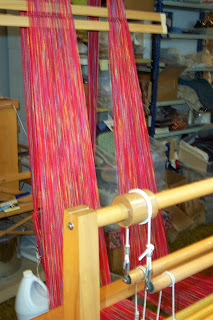 It will probably outlast the 30 yard red warp currently on the loom. Since I have lots of the 2/16 for warp, another one may be in the cards. I'll change the design, but there will no doubt be lots of inventory of table runners and/or towels in holiday season red for next year. Three warps. Three red warps. 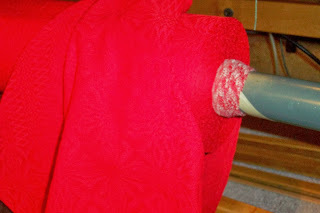 Turns out my stock of 2/8 cotton is much more depleted than I remembered and what I have the most of is red. So the next two towel warps on the Fanny will be red based. I have made a pretty good stab at staying on top of the administrivia, but will have to balance my ledger and cheque book so my papers can be delivered to the accountant before I leave. Since I'm up to date on my entries, though, that task should not take too long. She says, optimistically! And there is the writing for Handwoven to do, too. There is a call for instructors for a conference I'd like to apply for - that also has to be done before I leave. There is the planning for the Project That Cannot (yet) Be Named. I'd hoped to have done that before now, but other things have gone 'critical' and needed to be dealt with immediately. But it's time to get cracking on that project because I have a bunch of weaving to do for it. I have also been spectacularly unsuccessful at losing weight over the past 6 months. The best I can say is that I haven't gained any. :( Since my weight had been climbing, I suppose I can rate my efforts a partial success? But I had really hoped to peel off 15 pounds - guess that will go back onto my list of goals for the new year? Christmas will be a low-key affair - lunch with mom, then come home and weave? Sounds good to me! For me, the year more properly begins with the winter solstice. While I don't live nearly as close to the pole as some, the daylight hours get very short at this time of year and with the grey dreary days we have been having, I am longing for more sun. This time of year seems suited to taking time to withdraw from society, reflect on the year gone by, gather energy for the coming spring. And all those deadlines lined up on my calendar! I know this is supposed to be a really social time of year, but I 'spent' my social energies doing the shows and, quite frankly, I've had about enough of people for a while. So no, we don't go to a lot of parties, nor do we have a lot of family gatherings, either. 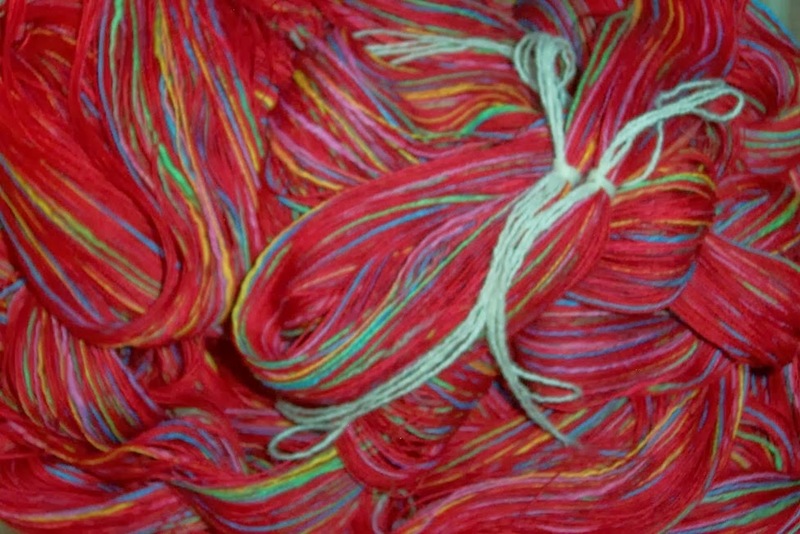 I am content to spend time in the studio working with brilliant colours, dreaming fibre dreams and looking forward to all the wonderful opportunities I have awaiting me in 2014. And because I am trying very hard to not buy more yarn, this red warp will have a design feature - half of it will be a deeper true red, the other half more scarlet. C'est la vie. Nothing is perfect. Make lemonade. It's how the light gets in. Etc. I haven't used a mill in any serious way for...decades. 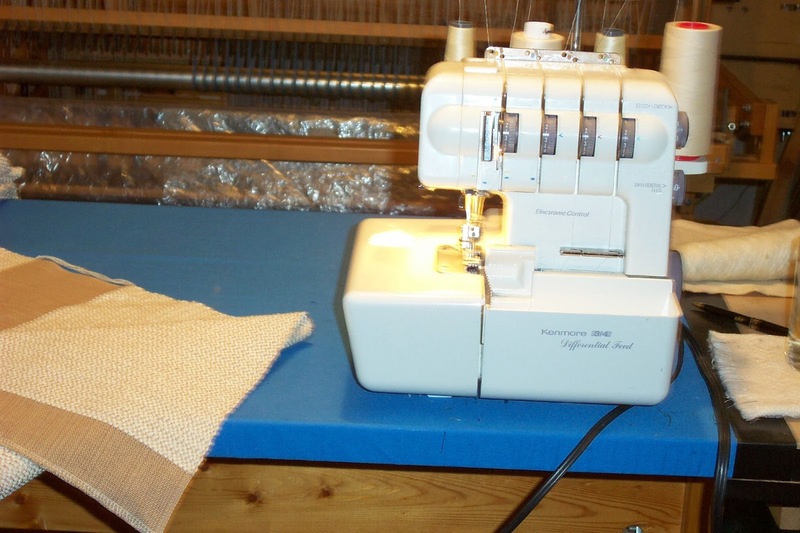 I used to have a small table top mill that I would wind warps on, on the dining room table. But I gave that up when I switched to sectional warping and never looked back. 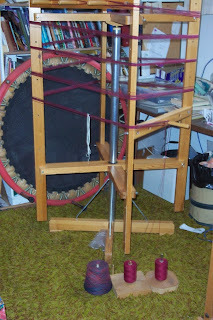 When I did need to start winding actual warp chains again, a friend had a warping board that she gave me and I have quite contentedly been using that for the last 15 or so years when I needed to wind a chain. 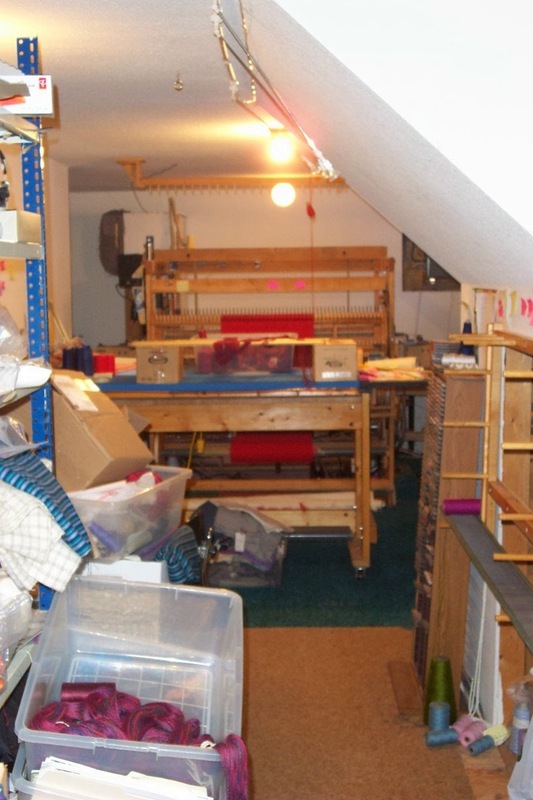 A couple of months ago, helping clear out a weaver's stash of equipment, the large (non-folding) Glimakra warping mill was in danger of heading to the dump so I offered to take it home and try to find a buyer for it. 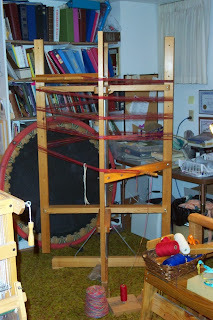 It sat in pieces at the annex until this afternoon when I brought it back to the studio and squeezed it into a corner so I could wind some warps that really will be much easier and faster on the mill than the board. Trust me - I've already wound one warp on the board and it wasn't much fun. Oh, I could do it if I didn't have any other alternative, but there it was, the large floor standing mill, sitting right there (in pieces) in the annex. Not everyone could fit such a large piece of equipment (30 inches on a side) into their home/studio and it was a stretch to get it into mine. Needless to say, I won't be using the trampoline much for the next little while! The plan is to wind as many warps as possible that will be easier/faster when wound on a mill, then store them until I have time to weave them. Once they are done the mill will be taken apart again and stored until I can find a buyer...or I find a need for it again myself. We'll see if I actually try to find a buyer or just keep it! PS - notice that I'm not using the full height of the mill. The Fanny is much happier with warps shorter than 13 meters and at that length, it fits quite nicely into the shoulder/hip distance of my body. So, while I'm standing to wind the warp (which I do at the board, anyway) there is no stooping/bending or reaching higher than just a bit higher than my shoulder. Mainly because that's where the pre-drilled holes were for the peg boards. Well, it's not actually terrible - yet - but it's snowing. And it's Christmas/solstice. And there's a Snowflake Weave-a-long on Ravelry so it sort of seemed appropriate that I use some of my and Lynn's red cotton and make some table runners using the Swedish Snowflake design. 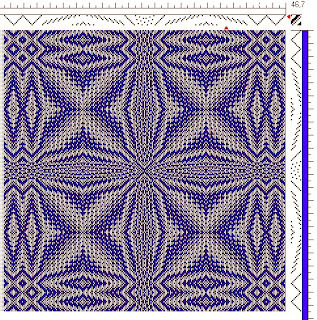 As luck would have it, my rendition of the design nicely fits into the number of ends I asked Doug to beam (24 x 32 = 768). Love it when that happens. There will be 4 ends left over if I've counted correctly. Or maybe 2. But yes, I'd rather have a few ends 'extra' than too few. So I'll sacrifice a few yards of yarn and not think twice about it! 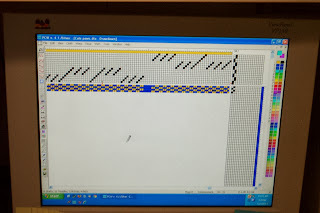 What I am actually going to do is use the motif as a border along each edge with a 'plain' centre. 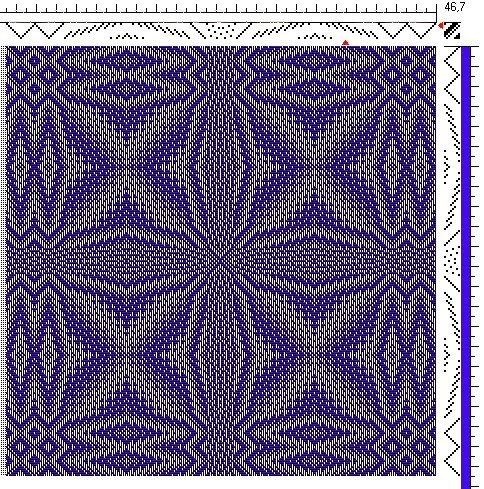 It won't actually be plain because I'm just going to thread on 8 shafts with point twill progressions between the motifs, so the centre area will be the elongated diamonds as seen on the edges. For the first part I'll use up the last of the fine half-bleached linen cone in some sort of twill variation, then swing into the actual motif when I run out of that. 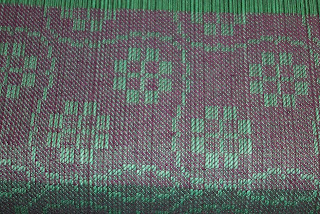 This warp will be woven as 'yardage' - in other words, I won't specially weave hems, just keep on repeating the motif and cut between them. 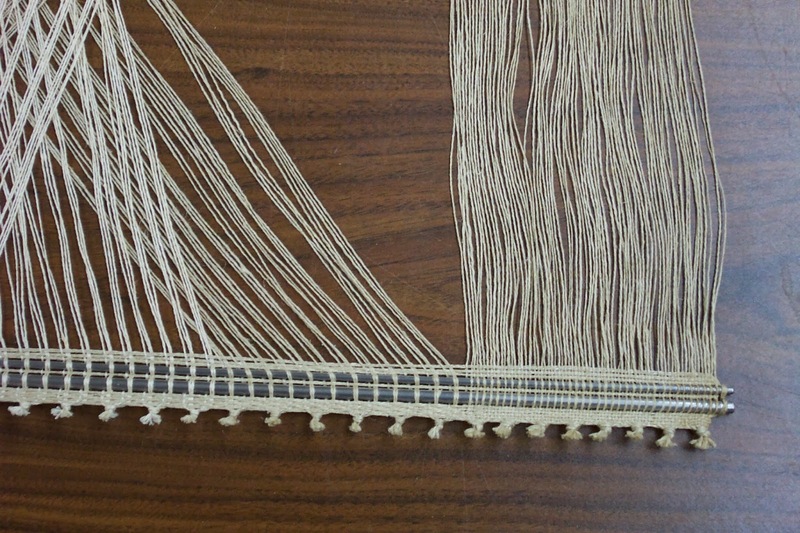 That way I can cut various lengths for longer and shorter table runners once the cloth has been woven. 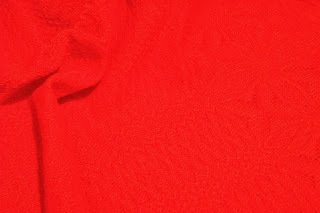 With the very short grey days we've been having, a splash of scarlet red seems just the right thing to put on the loom. In spite of a whole lot of distractions I did manage to rough sley, beam and begin threading the warp with the second cone of Lynn's yarn. But distractions abound! There have been so many that I completely lost track of the upcoming holiday season and realized we had not booked reservations at the one restaurant in town that actually does a Christmas dinner. It looks like they might be full, so now I have to scramble for an alternative. Cooking here at the house is not attractive, and mom isn't all that interested in doing a big family meal either. So, not sure what we'll do. Also realized that it is just 3 weeks until I leave for NC - and still no paperwork from the school. It's probably stuck in the holiday mail but I'm feeling antsy about booking my tickets. By the time I realized that, they were closed for the day so I just sent an email asking for the class list by email so I can contact the students. It also means that I'd better hurry up and book our tickets. Tomorrow Doug will beam a warp onto the AVL. My afternoon tomorrow is 'shot' with a badly needed massage treatment followed by a tune up with the chiropractor. My back has not been happy threading today, but I'm about 2/3's of the way through and still hoping to at least start weaving tonight to see how the cloth looks in terms of quality. 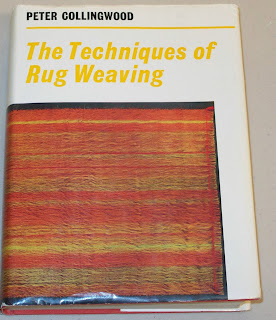 I still have the 'experiment' to do for Handwoven, a short article to write up in addition to the experiment notes, prepare class handouts for the Block Weaves workshop and pull the yarns for the warps. It's looking like I may have to send them by Expresspost (expensive!) in order for them to get there in time. I won't be able to fit it all into my carry on suitcase. Oh well! 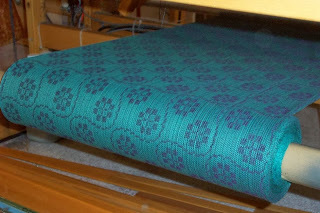 Managed one tiny bite - finished off the 'green' warp with some of the singles 16 half-bleached linen. Unfortunately there is still some of the linen left after the warp is finished, but I think I can use that on the beginning of the next warp on the AVL. I have also decided what to do with the variegated cotton flake. After my break (icing my shoulder and resting for a bit) that warp will get wound. I think there is enough for a 7 meter long warp which should yield 6 towels. The thing is, I rather suspect there are a few more cones of that particular yarn somewhere in the boxes we packed for me to keep, but they might still be across the line. So I'm hoping to just use up this one cone, at least to start. This warp will go onto the Fanny. Tonight is guild drop in and I may swing by the annex. Doug unpacked all the boxes yesterday so I can at least see what I have. That way I can begin planning the next couple of warps. OTOH, I do still have a couple of deadlines I need to deal with, too, so we will see how quickly I can get cracking on the next couple of warps already in the queue. 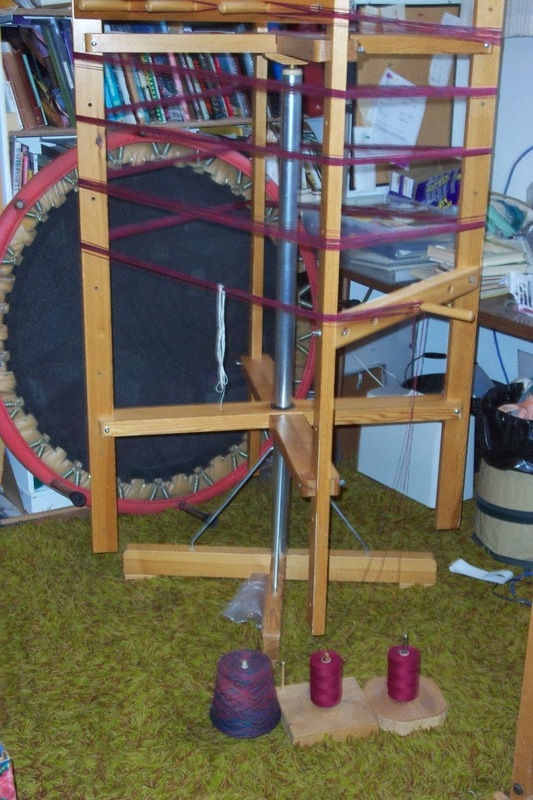 This morning I determined to get back to the loom pronto, so after a quick trip to the post office to pick up two bunny-eared-bags-of-goodness (about 80 pounds of yarn from Maurice Brassard), and a gift (see below) I fired up the loom and got started. I had intended to finish this warp with some 2/16 pale yellow, and decided to dig into the boxes (I brought two of them in with the other yarn) and see what I could find. There were also a couple of cones of cotton flake, strong enough for warp, so I'm thinking of throwing a warp on the small loom for table runners. Or towels. I haven't decided yet. The cotton flake is a bit thick in the thick bits, so the overall cloth might get too thick for towels. Unless I use 2/16 cotton for weft in plain weave. I will cogitate on that for a while. 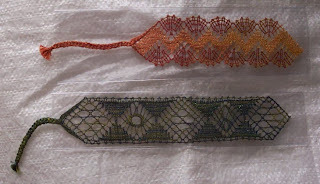 And the gift in the mail (apologies for poor photo) were not one but two bobbin lace bookmarks made by Deb Todhunter. As you may know, I am an avid reader, and having handmade bookmarks just makes the whole experience nice. Speaking of books, I did manage to read a bit (long drives as a passenger gave me some time in the car) so I read Bruno, Chief of Police by Martin Walker and The Black Count by Tom Reiss. I think both were recommended by Dana Stabenow (another author I enjoy reading). The Bruno book is the first in a series which I will likely continue to read. It was a nice light read. The Black Count is non-fiction - about the father of Alexandre Dumas. But it wasn't just a biography - it covered a part of history I knew far too little about - the treatment of 'people of colour' in France before, during and after the French Revolution. Currently reading The Serpent's Shadow by Mercedes Lackey. It is the first in a series - she has many different series - but the books don't need to be read in order. Lackey is an author many people have recommended to me over the years - I have finally gotten started on her works. We are a little over half way home and while it is getting dark the roads are clear. We may press on after we stop and eat. So we have elected to stay one more night and leave in the morning after a good night's sleep. 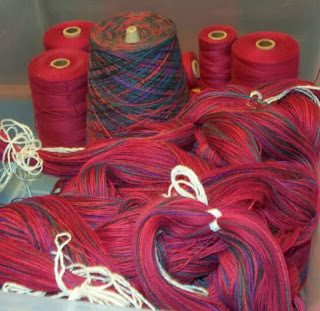 It has been a physically demanding job, sorting through all the yarn, deciding what to keep, what to toss, what will go to the guild. Before things like this get better, they have to get a whole lot worse, but the yarn is now bagged in clear bags and stored in just two places in the house. Once it is picked up there will be a lot more room in the basement! We have the van loaded up and another stash stored at a friend's place, which we will pick up in January. In the meantime I am not sure when I will be able to start using the yarn - my studio doesn't have much room for the quantity of yarn that will eventually be added to my stash. But after helping with the 'estates' of three people, I am more determined than ever to get busy and weave it up. We are about half way through sorting through the yarn. We have set aside numereous boxes to bring home but there is at least twice as much left which will go to the guild to be sold as a fund raiser for the scholarship fund. I am hoping to finish the basement tomorrow and head for home Saturday. Hopefully by then the roads will be in better shape too. Apparently it started snowing when we left and dumped a meter of snow. I'm not sad to have missed that! We arrived about 1 pm and the guys went off to buy boxes to load the yarn up into. So far I've sorted through one room. Essentially separating the sheep from the goats, so to speak. Yarn stored for a very long time can go 'bad'. Especially fine yarns dyed a very dark colour. So the first thing I am doing is testing each cone of yarn for structural integrity. There is no point keeping anything that won't serve, even for weft. It is a good lesson in 'use it up before it goes 'bad'. Once the guys are back with the boxes I will then sort through the piles of 'good' yarn, deciding which I will keep and which I won't likely ever use. There are 3 more rooms and the basement to go through. The basement being the biggest challenge. There is a bit of a hokey tv show I got hooked on during convalescence for my broken ankle called Canada's Worst Driver. One of the 'isms' they are constantly telling the bad drivers is to "look where you want to go". It's a good thing to remember for life in general. Having successfully navigated the show schedule, I am now facing the deadlines for the next 7 months. In order to not feel overwhelmed, especially when I'm so very tired, I decided that I really need to just focus on the next deadline and not worry too much about what comes next. I am well aware of what is coming up - in many cases all too quickly - but if I'm going to continue to successfully navigate the shoals of my upcoming calendar, I need to not panic about the things that are in the distance but to stay in the present. Stay in the 'now'. Stay focused on the next deadline. The weather forecast for tomorrow looks good so we will head south, with a couple of stops along the way. We'll stay overnight, then finish the trip Wednesday morning, tackling Seattle traffic during daylight..
We have dust masks, 'rubber' gloves, changes of clothing, an order of boxes awaiting us and taping gun. We have a place to store some of the yarn since we will not be able to bring everything back in one trip. I have a couple names of people 'local' who I will contact to see about the yarn I can't bring back. We have an open ended trip planned because we truly don't know what awaits us. Now that the eBay auction is all but done, the majority of the items shipped, the rest to go into the mail on Monday, I feel as though a great weight has been lifted. After throwing myself a pity party yesterday, I have - I think - managed to thrash my way through my testiness and regain a sense of equilibrium to find the silver linings. 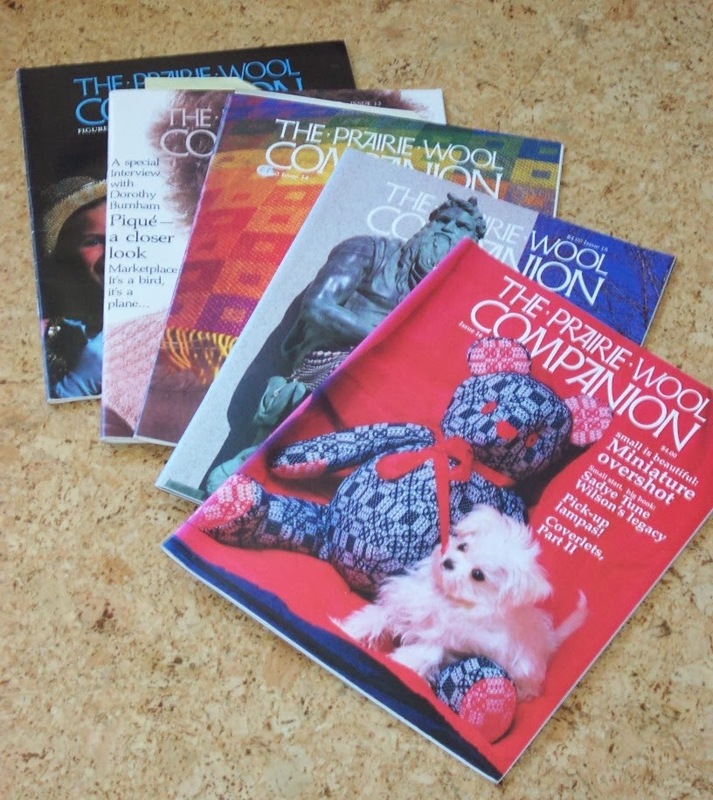 The Peter Collingwood textiles will go to new appreciative homes as will the books and magazines. Jean's son will get a cheque, which will no doubt help with expenses and so will my local guild. The guild sale is well underway. I got some nice yarn to knit scarves for a donation but even better, some of my 'orphan' textiles (discontinued lines) have found new homes. I also have someone signed up for the workshop in March. It would be nice to have a couple more, but I will run it with two. Best of all, I have had some quiet time to sit and knit and not think about much of anything. As an introvert, all the intense interaction with others over the past six weeks was wearing. It was time for a little quiet time with no immediate pressures. At lunch I went home to deal with the last of the eBay auction and while I ate lunch watched a TED talk on living a grateful life. It was just what I needed. It reminded me that we can choose to be happy in spite of the stress of life. Yes, indeed we can. We just have to remember to stop, look and do. Be peaceful. Be grateful. Find the silver lining, because you know there will be clouds. It is also dragging me down emotionally knowing that there will be little time to deal with it all given my schedule for the next seven months. In other words, as soon as I get home I have to: finish the two articles for Handwoven; prepare the yarns and drafts for the Block Weaves workshop at John C Campbell (yes, the classes are a go), get ready for Fibres West in March, weave more samples for the shop in Vancouver, prepare for a beginning weaving class in March, and onwards until the project that cannot be named in May, which will require a great deal of my time and attention in order to successfully complete that. I don't see a lot of time left over, even for weaving with any of the yarn legacy. The end of the navy (almost black) cottolin and the beginning of the purple cottolin. A quick-ish change in the tie up and here is the more traditional 'snails trails and cat's paws'. 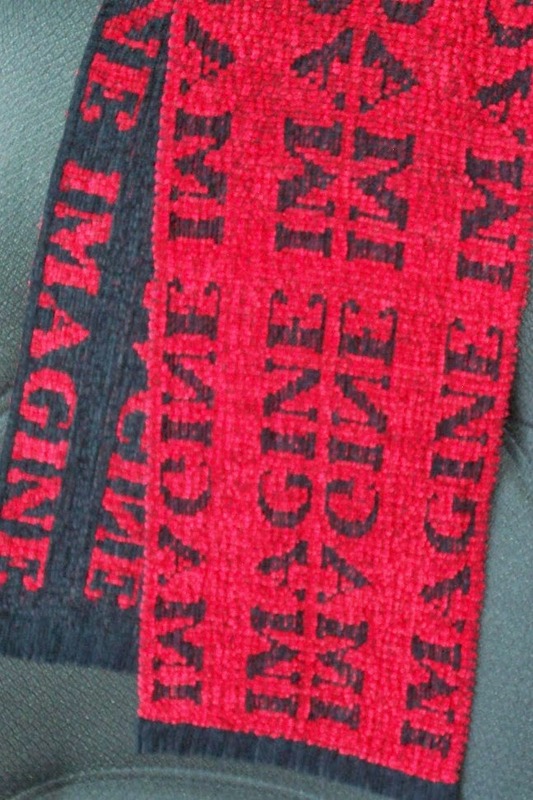 And here is the back side - which in both cases will likely become the 'right' side of the towels. This is a 16 shaft design and in order to weave it 'right side up' would require lifting 10 shafts. Weaving it 'upside down' requires just 6. I like both designs but will more than likely finish the warp - once the purple cottolin is used up - with a pale yellow cotton in the cat's paws - it should look a little like flowers on a green field? It seems that this time I have wound a warp long enough to use up all the rest of the cottolin from the summer tops I wove last year. 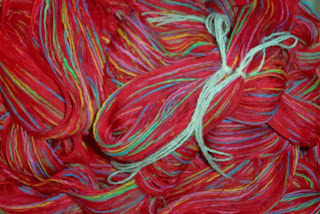 Of course, I've just ordered more cottolin for a special order and no doubt will have yarn left over from that project! Never seems to end, somehow. 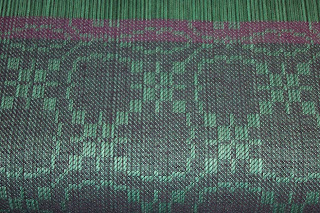 This is the warp I had to stop and re-thread about 2/3's of because I relied on my memory to hold the threading repeat accurately. Big mistake when I'm this tired and stressed. Seems like memory is the first thing to go when you get to be my age. Actually, it's always the first thing to go - doesn't matter what age you are. But never mind, once the lease sticks were in, it was a fairly simple matter to get it re-threaded - this time double checking each repeat before moving on to the next. 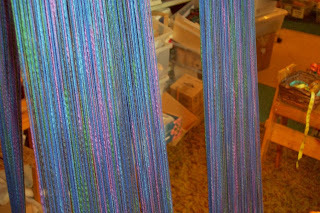 The warp is 30 yards and it isn't likely I will come close to finishing it before we leave again. Tomorrow the first eBay auction ends with the second one ending on Friday. I am hoping (really hoping hard) that I can get paid for everything so it can all get shipped by Monday at the latest. That will clear one volunteer obligation off my schedule. What with the guild sale happening this weekend, it isn't likely that I will get much loom time for the next few days, either. But hopefully once the trip south is done I can concentrate on doing the experiment for the Handwoven article, finalize the class at John C. Campbell Folk School - it was looking promising that the Boot Camp at least would have enough to 'go' - work on the Project That Cannot Be Named - and who knows, maybe even take a few days 'off'. I've got a stack of books and some jigsaw puzzles I'd like to veg with for a day or two. My calendar for the first 6 months of 2014 is full to bursting. I'm going to have to stay on my game in order to not slip up and miss a deadline or two. A local guild member, inspired by dealing with Jean's weaving 'estate' decided to down size her studio, too. 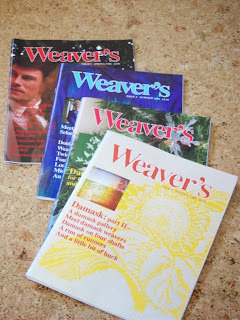 She delivered two bunches of magazines today - Handwoven and Weavers. Since I'm already running an auction on eBay, I decided I'd simply carry on and just finished listing the 5 issues of Prairie Wool Companion as one item, and Weavers in bundles of 4, except for issues 43 and 44 which are listed as a pair. And I realized I'd neglected my reading list, so since last time I included my reading materials I have finished Kathy Reichs' latest (title escaping me at the minute) Raising Cubby by John Elder Robison and started Mercedes Lackey's Steadfast. I have very little time or energy to read right now but I do try to fit a few minutes in here and there - at the doctor's office yesterday, the lab this morning, a few minutes before bed. I am really hoping that when we've done with Lynn's yarns I can take a few days 'off' to recuperate from what has become an amazing year - all the trips, all the deadlines, all the stress. The latest is Doug's step-mom who fell and broke her hip and is currently either still waiting for, or is in, surgery. Any chance the shipment of 'boring' is arriving soon? I could use a little. Either that or a crate of energy. voluntold: Offering someone else as a resource; and then informing them of their impending generosity. Usually refers to spouse or offspring. p.i.t.a. : Polite Canadian acronym for a pain in the a**. 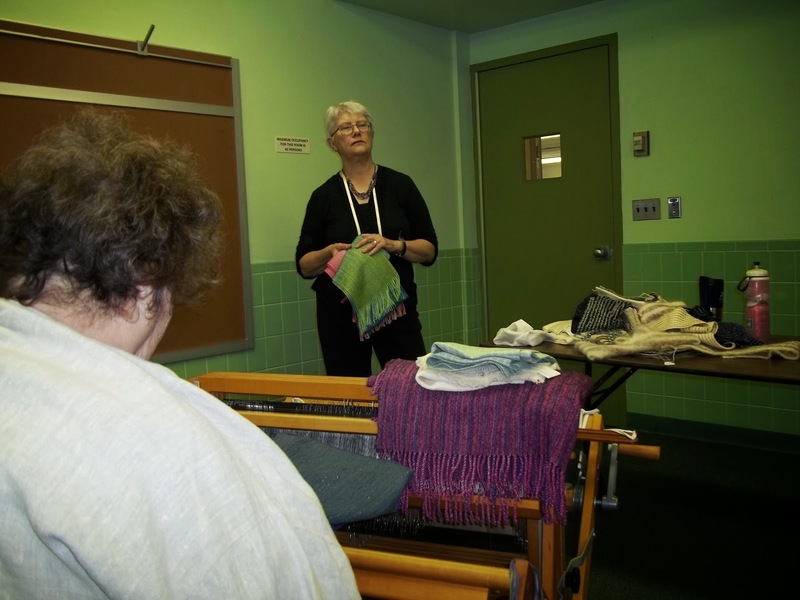 I planned on taking the felting class at EGLFC 2013. The incentive behind my primary plan was to be able to do the conference without having to drag a loom along. 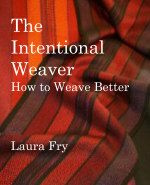 For all the right reasons, I changed my mind at the last minute and signed on for The Efficient Weaver with Laura Fry. I took comfort in the thought that we only needed to bring a warp and loom; not a warped loom. I did briefly agonize over the vague parameters of the instructions: scarf warp, 16 to 20 epi, about 10” wide. Too many possible choices! Luckily we had just acquired Ann Dixon's book of 4 harness patterns. I picked out a simple Bird's Eye twill, fed it wrong into my Fiberworks PCW and got something I liked much better. 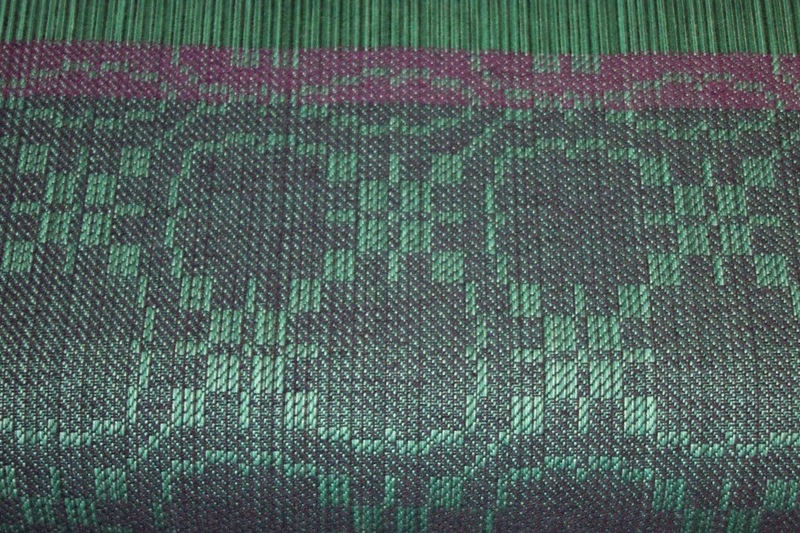 I made my warp with 161 threads of aqua marine 5/2 pearl, printed out my pattern and packed my bags. Our teacher described herself as “stern looking at rest”. Her towering height demands she look down on most everyone. The corners of her mouth fall into a natural frown unless engaged. 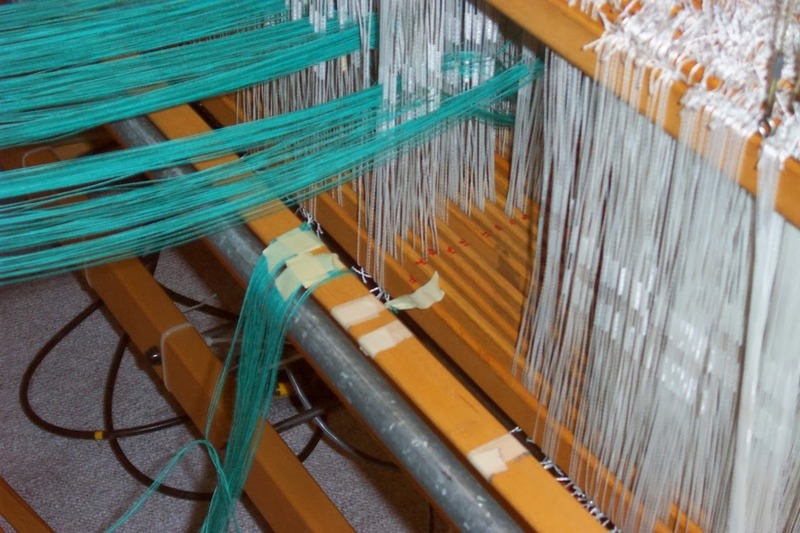 Laura Fry makes her living at the loom. A true production weaver, she can't waste time or resources. She weaves rectangles all day, every day; and she weaves to sell. 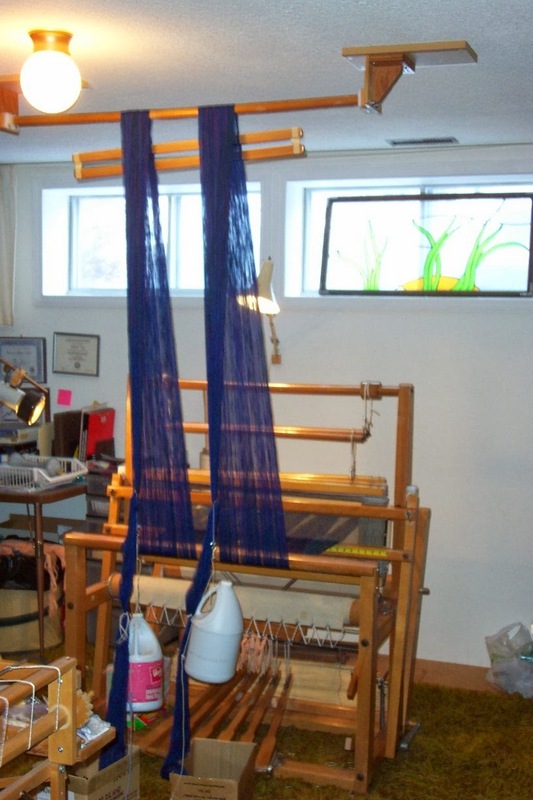 An impressive number of years at the loom have given her the wisdom of self awareness as to what works for her and what became an alterable “p.i.t.a.” The Efficient Weaver was all about developing efficiency through our own self awareness. Most of the time we were all laughing. Written neatly on the board when we came in was “If you are happy with your results, there is no need to change anything.” I know I am barely past my “if it's cloth, it counts” stage of study, but I had not thought myself unhappy. I know parts of the process hurt more than others, but in my ignorance, I didn't know enough to know I could do more about it than ache. Happily for me the dawning awareness of my discontent coincided with it's cure; the little tweaks and changes that could lead to the bliss of conscious control. The first day she showed us how she wound and warped, and she explained the why behind the way she did everything. All had been thought out to eliminate wasted time or unnecessary discomfort. Laura explained that every rule ever made, fit somebody, at sometime, in a specific instance, but it's not always true or necessary for everybody all the time. The key is to knowing what works best in the current time, place and situation. She distilled what she found worked for her and wrote it on the board. Never tie a knot where a bow will do. It isn't finished till it's wet finished. If you can't be perfect, be consistent. A thread under tension is a thread under control. She advised that we would still need to answer to our own personal perfection police, but then she granted permission to throw most of the rule book out the window stressing that we were to “Choose your expert; then learn enough to become your own expert.” It was like having a big sister wrap her arm around my shoulder and share the wisdom of her experience; telling me what to watch out for, but letting me know that some rules could be broken without the likelihood of incarceration. The second day those of us who had not cheated and done so in advance, got warped. She showed us a nifty way of securing lease sticks for use in warping to eliminate any possibility of dropping the cross. I initially failed to grasp this lesson; along with the sticks as they fell to the floor and pulled out the pourey as they went. It turned out my personal disaster simply produced another teaching moment for Laura. With a pick-up stick and 5 minutes time I was back in business. It took longer to confess my disaster than to fix it. I learned to keep tension. I learned a better way to thread heddles and lash on. 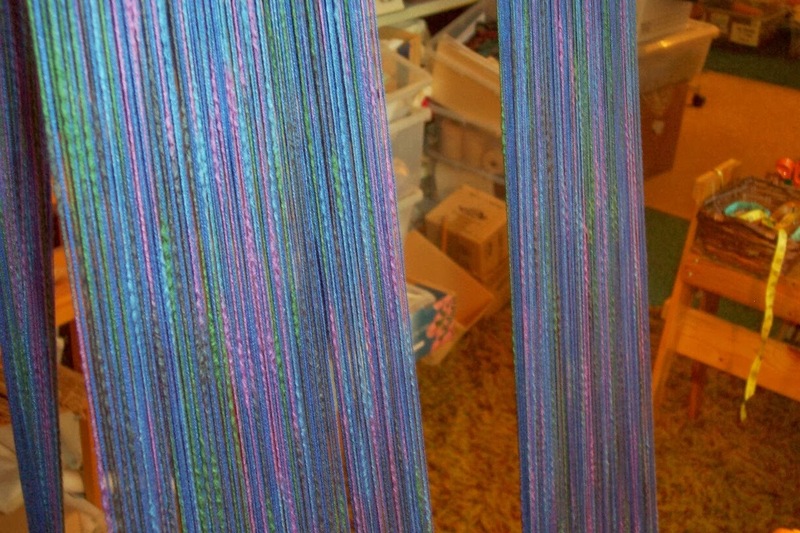 Most of the warping process went much faster and was under much better control. I won't embrace all of it for my Brown, but I will cheerfully adopt what I can adapt to my best use. 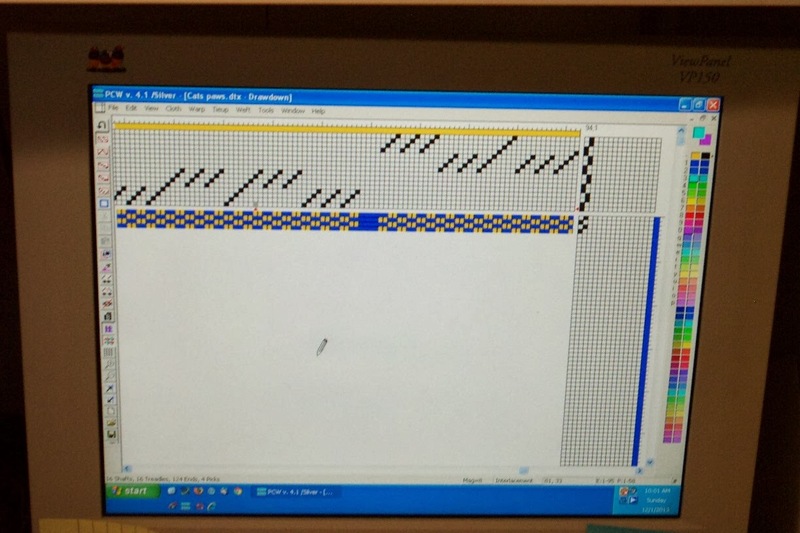 I saw my threading error early and choose to accept it's annoyance in trade for the time it would take to repair. 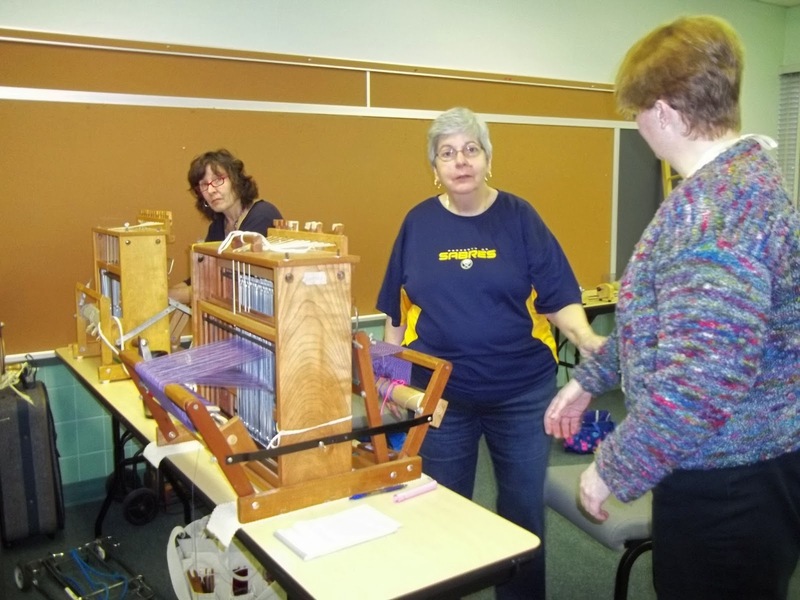 It was a workshop warp, and I wanted to weave. I spent most of the the rest of my time practicing my thumbs-up shuttle throwing. 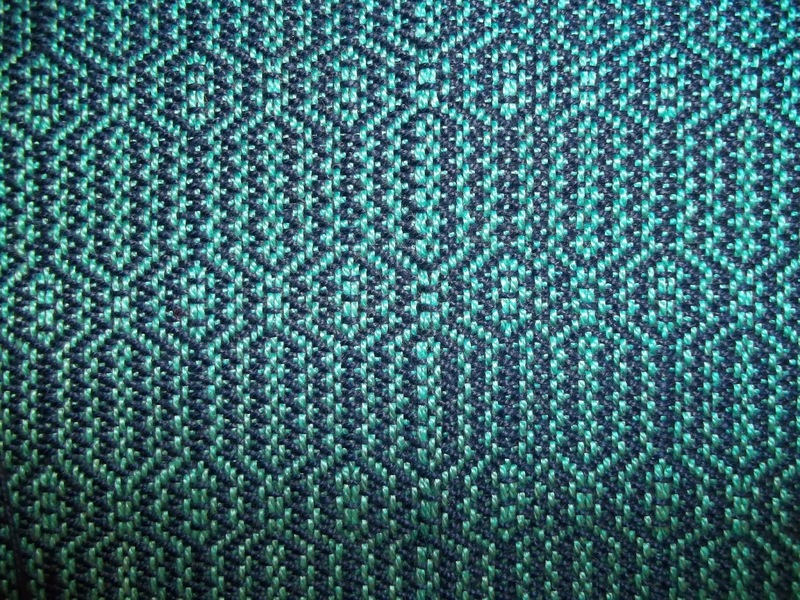 The combination of my easily memorized pattern repeats and the new techniques made the yards I wove on the last day almost meditative. I was working at least three times my normal speed. I'll have to improve my bobbin winding if I'm gonna weave this fast. I won't share the long list of hints, cheats and suggestions offered during class time as there is too much for a single report. Luckily for all, Laura Fry is all over the internet. Find her website at LauraFry.com, or her blog at http.//laurasloom.blogspot.com. She has made over 20 video clips available on YouTube and is active on Ravelry and Weaveolution. We have her book Magic in the Water in our library. It's all worth the look. I knew I was tired. I knew I was distracted. I knew my mental faculties were less than sharp. And once again I overestimated my capabilities! Instead of marking off my draft as I completed each section, I relied on my dulled brain to follow the draft, so when I reached the end of the repeat, instead of having used up all of my ends as my math (always shaky at best) told me would happen, I was left with a whole bunch of threads left over. Which means I'm going to have 'extra' ends left over. But much better 'extra' than too few, right? If you look closely you can see a red line on the right hand side. To the best I can determine, all of these threads are correct. I will only pull out the rest of the warp, not this bit. Fortunately I'm fast at threading so it won't take too long to get the warp correct. 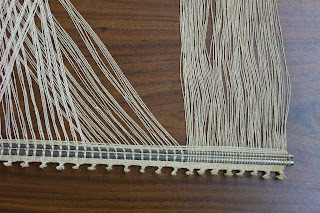 As for the 'extra' ends - they will get wound onto a couple of cones as the weaving progresses as they roll off the beam. They won't be 'wasted' as I will give them to a friend who is willing to salvage them for use in her weaving. Am I happy about making such a silly mistake? No. Am I going to beat myself up about it? No. I'm just going to knuckle down and get it fixed. Hopefully today after I do the pressing of the mats and samples for the Handwoven article I got run through the washer and dryer yesterday. A few months ago, doing some research on weavers who had sadly gone on to where ever we go when we leave this plane of existence, I was checking Wikipedia for biographical info on people like Peter Collingwood, Mary Black, Allen Fannin, etc. And found precisely nothing on Wikipedia. 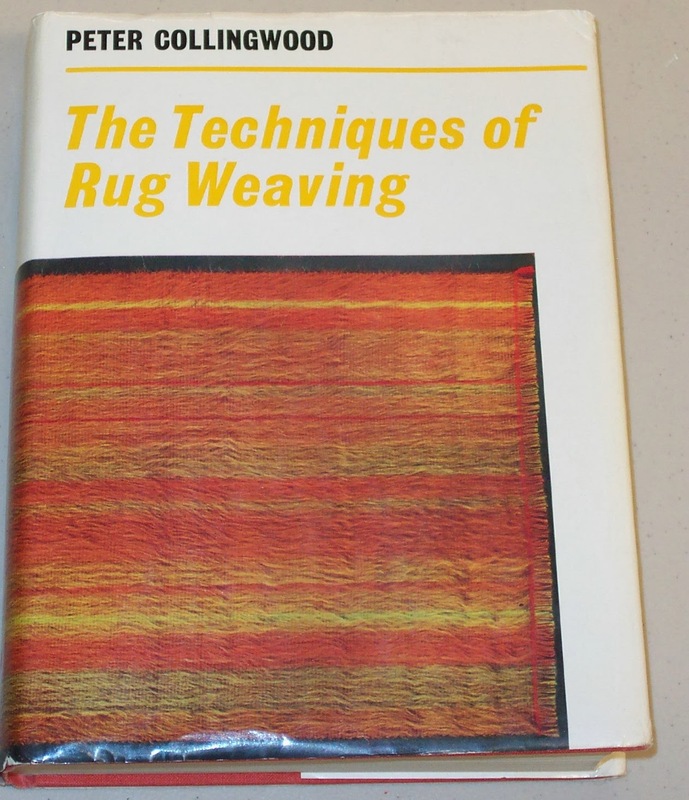 The only weavers I could find listed there were Anni Albers and Jack Lenor Larsen. 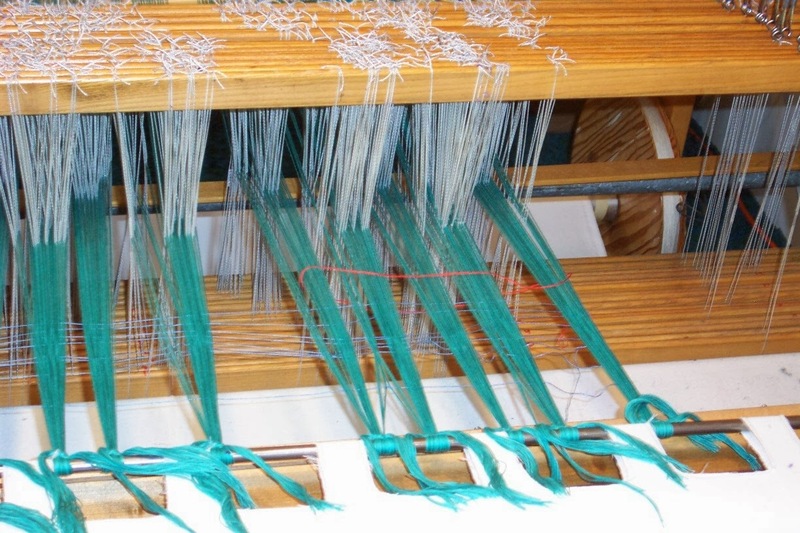 It occurred to me that one way to improve the profile of weaving and weavers was to start pages on the internet 'encyclopedia' and link them to the subjects 'weaving', 'hand weaving' etc. Not being particularly savvy when it comes to the internet, nor knowing any of these people particularly well, I have approached several people who might be in a position to begin such a project. But it also occurred to me that anyone can start a page, not just someone who knows anything about the internet. 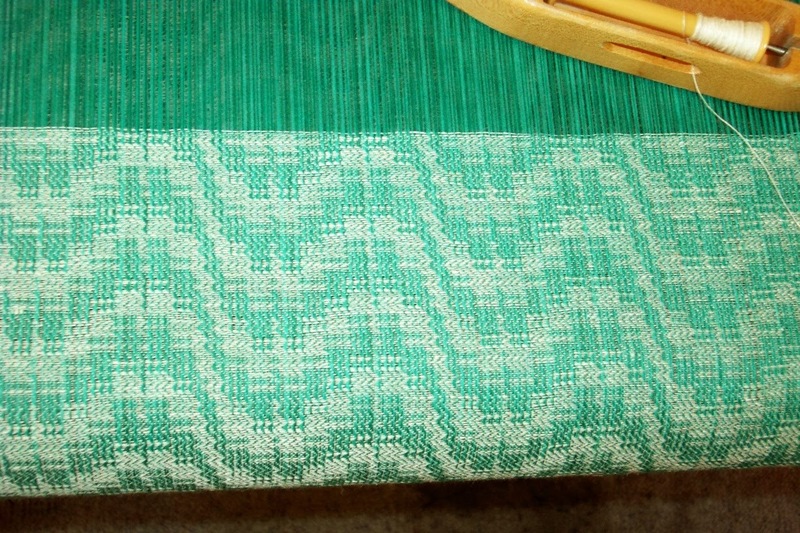 And so I am challenging the weaving community - we have been complaining for years about weaving getting no respect. About the greying of the guilds. About how we need to attract new, younger weavers to the warped side. The gauntlet has been thrown down. Who will pick it up? My friend quietly slipped from this mortal plane to the next during the night. Whatever there is beyond this existence, I hope that she has found peace...and maybe a spinning wheel and loom with every yarn/fibre imaginable at her disposal. Warm the loom bench for me, Jean. A friend came today and helped get all the auction items listed on eBay. The auction will run for 7 days beginning today around 1 pm when she hit 'publish' on the books. The Peter Collingwood pieces will end around 9 am in 7 days time. This has been a very 'strange' year with all the critical deadlines, traveling, friends facing health issues - and in some cases losing. A reminder that life is precious and sometimes all too short. Today is American Thanksgiving. We have never made too much of holidays, partly because we don't have kids, partly because the autumn has always been so stressful. Holidays like Thanksgiving were just another day to work and get ready for the upcoming sales. So today I spent time with friends. Lunch with one, a couple hours visiting with another and two more hours visiting with a third. I even managed to weave a little. Today was a good day. A day to give thanks, regardless of how socially sanctioned it is. A day to appreciate laughter - and a few tears. To remember those who aren't still here to hug and share joy and laughter. A day to be grateful for still being here. Still able to play with string. A day for thanksgiving. Just like every day should be. Where would we be without people willing to give freely of their time and energies? A lot poorer, I'm sure. It was especially appreciated that two of the guild members pitched in last night and worked on recording the details of the books that are going up for eBay auction in the next few days. Instead of doing their own work, they took the time to assess the condition of the books, set down title, author and rate them so that once I start entering the items on eBay I won't have to take the time to do it. In fact, I called on another friend who said she was willing to come tomorrow and get started on doing that part of the job, which will allow me to dig into what needs doing in the studio. eBay has changed their format so I will go through it with her tomorrow morning, then hopefully she can go ahead and do the auction stuff for me without any further input, but if needed I will only be a call away. 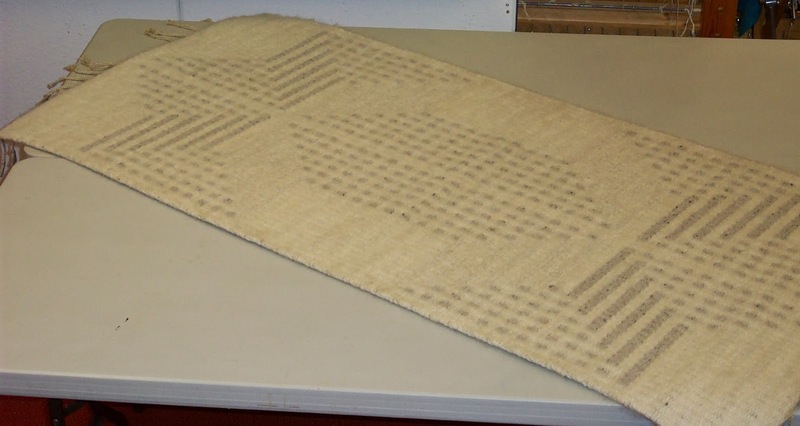 The auction came about because the guild had a Collingwood rug that needed to be sold. A re-arrangement of the room meant we no longer had wall space to hang it. At the same time a weaving friend in another community entered hospice. Her son needed to put his mom in hospice and his dad in care. 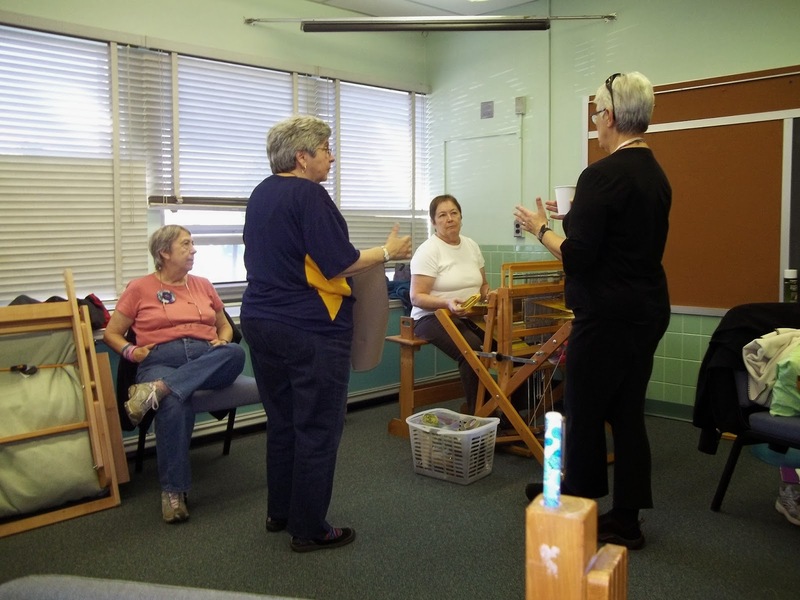 A mutual friend started by helping him find homes for her many spinning wheels, looms, yarns and books. And a Peter Collingwood rug AND macro-gauze. 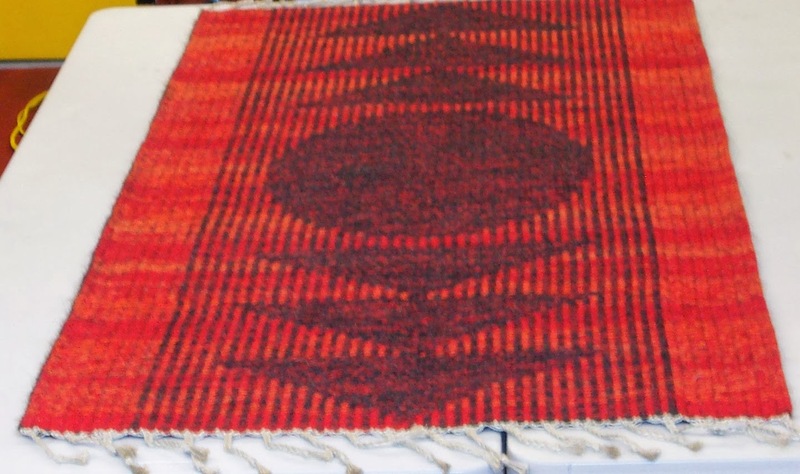 Since I was going to do an auction for the guild rug, I offered to do hers as well. Then when the guild received her books, many were duplicates to what the guild already had, some of which are out of print and still sought after. So, what the heck - why not auction them, too. What I forgot was how much time doing an auction was going to be. Not to mention the sudden acquisition of my other friend's yarn stash! But I was able to get photos of everything last night, today they were edited and saved for the listings. I am not sure when the auction will go 'live'. I have to review the eBay auction format, etc., but I am hoping to get everything dealt with before Christmas. It took three of us 90 minutes to clear the basement of tools, wood, bits and bobs of wooden parts for various fibre crafts. Doug will finish what tools can be finished and sell them. Possibly at Fibres West next March. We may have to make a second trip as there is much more than anticipated (there always is!). Some of Dougs wood turning buddies will be gifted the hard woods as he doesn't turn wood. Perhaps they will turn some parts in return. 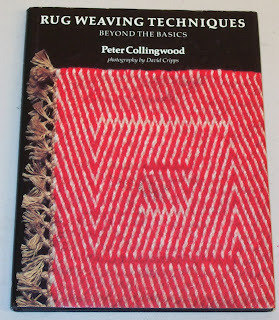 Tonight I will begin photographing the Peter Collingwood items and books that will be auctioned off. I'd like to have the auctions done before Christmas so I can at least get this commitment completed by year end. There will be the yarn that is coming home in December to sort as well. So far no plates have dropped. We will keep on juggling! Set up took us from 5 pm to not quite 7 Pm. We are as ready as we can be for morning. This show is smaller and no booth drapes are provided. The weather is supposed to be good. Cold enough that outdoors will be chilly, not so cold to prevent people from coming. If they are so inclined, that is. In many ways I feel as though my calendar commitments reached critical mass with the closing of Art Market. It's not that my calendar isn't full to bursting but the last two shows of the season are small, closer to home, and should prove to be a lot easier than the last few shows have been. I also realized that I was overly optimistic that I could actually have the last place mat warp finished in time for the show in Williams Lake so today I just cut them apart and serged them. They will go into next year's inventory. 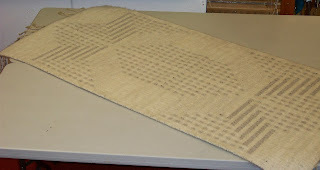 One of the reasons I wanted to get them done was so that I could begin weaving the samples for the Handwoven article. 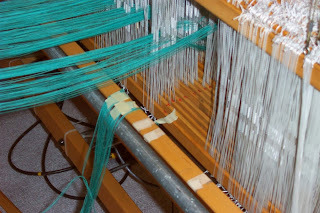 The deadline isn't until Feb. 28, but with all that needs doing between then and now, the trips I have to make, decided that I'd at least get the weaving done now. The intention is that I will do the experiments and write them up (while still fresh in my mind!) and send them off as soon as I possibly can. Then I don't have to think or worry about them anymore until it comes time to do the final edits for publication. In the next two weeks I still have to photograph the guild books for sale - although a friend has offered to help and I asked if she would do the entering on eBay. If I can get the auction started by Dec. 1 or 2 I won't have to think about that until after I get home from sorting through my 'inheritance'. Once we get the boxes of yarn home they will just get put in storage until much later as there will be zero time to even look in them for several months. I should also know by then if the class at John C. Campbell Folk School will be going ahead, although the numbers looked promising. 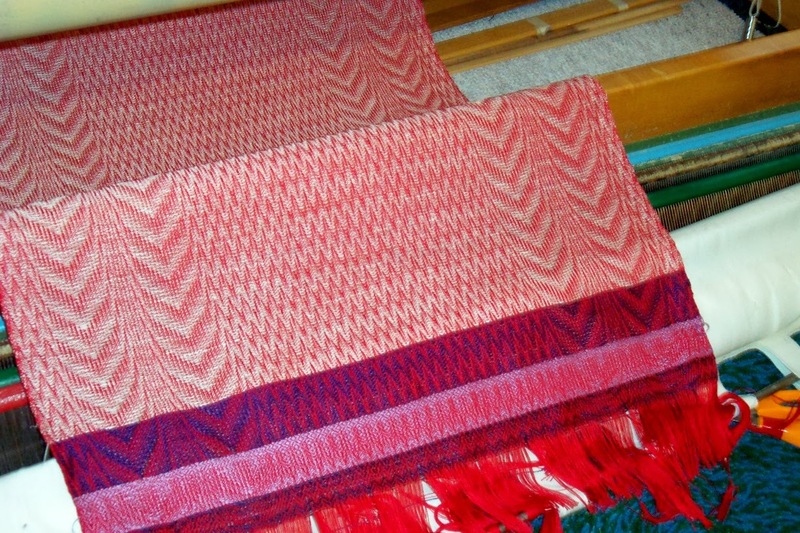 Which means I have to get the warps for the two day workshop on Block Weaves ready and mailed off before Christmas. March we are planning a Beginning Weaving workshop here in Prince George, plus we may be doing a fibre festival in the Lower Mainland (Vancouver area) as well. I have to double check dates to make sure they don't conflict. April I'm teaching in Tacoma, then giving the guild program to Vancouver guild. And then, ta-DAH! The project that cannot be named! 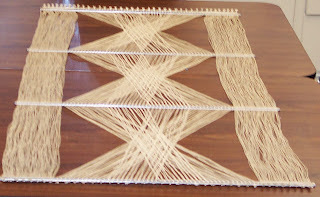 For which I have a whole lot of weaving to do in preparation for it. 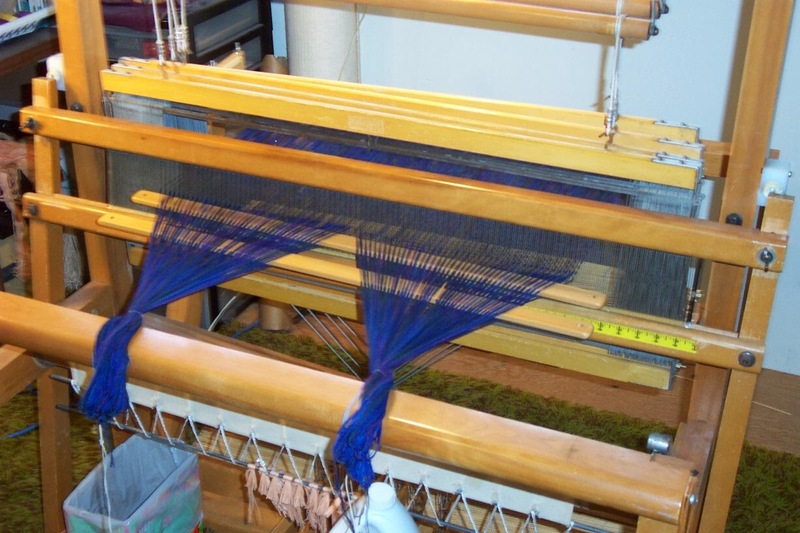 In June I will be at Olds Fibre Week teaching the Level 2 weaving class, jumping into the truck and heading back to Tacoma where I will do a seminar at Complex Weavers. If anyone signs up for it. All of these teaching dates are subject to cancellation. And that's just the first 6 months of 2014. 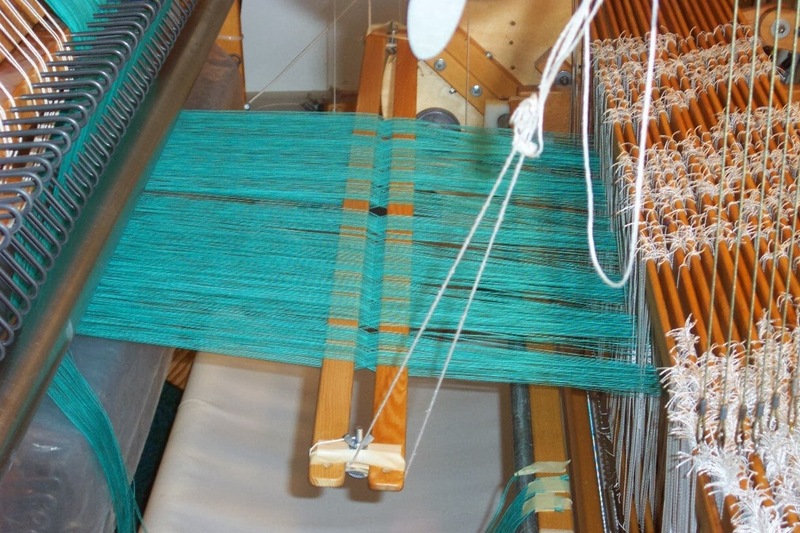 I still have to weave new inventory for the fall season, so it looks like I'll be slamming the warps through the loom(s) like mad all through July and August. It's my life. Obviously I love it or I wouldn't be booking all these things! Two weeks away from the loom and I can't tell you how many times I dropped the shuttle this morning. Obviously out of practice! 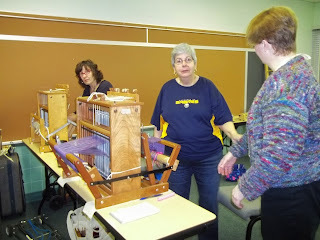 Which brings me to this thought - if you want to get really proficient at weaving, it is something that you need to do as often as you are able. 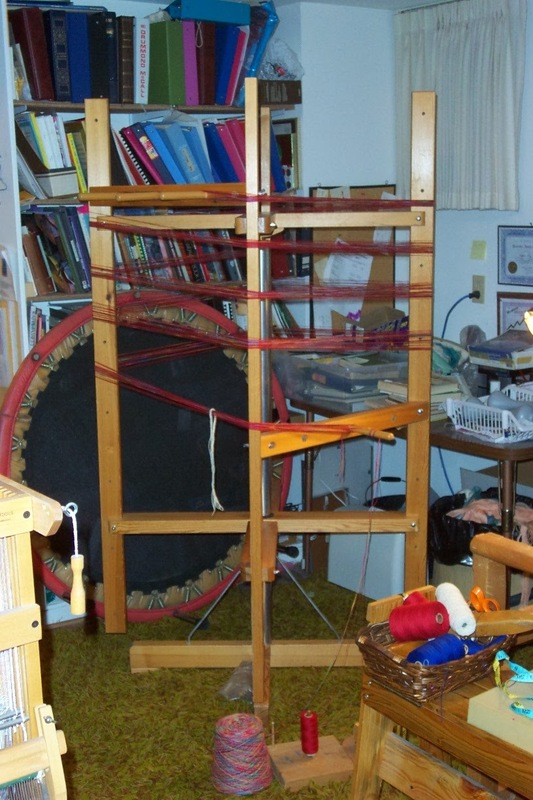 Even 15 minutes in the evening - after the kids are put to bed, after work, after...whatever claims your time...just 15 minutes to sit down, relax, commune with your loom and yarns and remind your body of the physical motions involved in whatever aspect of weaving you are working on at the time. Weaving is physical. It requires the physical effort of your body to happen. No weaver, no weaving going on. Even the AVL with all it's bells and whistles does not weave by itself. It requires someone sitting there shuttle in hand (or flyshuttle cord in hand) with a foot to open a shed and hands to bring the beater forward. But now it is time to put my Bean Counting hat on and analyze the results of the 3 largest sales that we do. The results were unpredictable (as they always are). There are a million reasons for people to not buy a 'luxury' item (which a hand woven textile most definitely is). Any bobble in the economy - global or personal - and people will zip their wallets up tightly. So it is always a gamble to pay big bucks for a booth space at a high end show, the costs of travel, the wear and tear on the body to drag your booth and product hundreds of miles (literally!) as well as the wear and tear on one's psyche when people look you in the eye and say in all honesty that they can't afford your prices. My problem (or challenge?) is that I have devoted my life to the construction of textiles. I have invested my entire being in trying to design and execute the best possible cloth I can make and I can do it with a fair degree of efficiency. I love what I do but I have not (yet) won the lottery. The only way I can continue to bring my fibre dreams into reality is to try to sell them. And so I will most likely do most of the shows next year that I did this year - excepting Seattle which for a number of logistical reasons just isn't working for me - and taking in the feedback I received from the public try to come up with more attractive textiles that I hope will entice people to purchase. Because quitting isn't an option!